This article describes a method by which one can mimic in vivo development of the Drosophila mushroom body in an ex vivo culture system. Prithviraj, R., Trunova, S., Giniger, E. Ex vivo Culturing of Whole, Developing Drosophila Brains. J. Vis. Exp. (65), e4270, doi:10.3791/4270 (2012). We describe a method for ex vivo culturing of whole Drosophila brains. This can be used as a counterpoint to chronic genetic manipulations for investigating the cell biology and development of central brain structures by allowing acute pharmacological interventions and live imaging of cellular processes. As an example of the technique, prior work from our lab1 has shown that a previously unrecognized subcellular compartment lies between the axonal and somatodendritic compartments of axons of the Drosophila central brain. The development of this compartment, referred to as the axon initial segment (AIS)2, was shown genetically to depend on the neuron-specific cyclin-dependent kinase, Cdk5. We show here that ex vivo treatment of wild-type Drosophila larval brains with the Cdk5-specific pharmacological inhibitors roscovitine and olomoucine3 causes acute changes in actin organization, and in localization of the cell-surface protein Fasciclin 2, that mimic the changes seen in mutants that lack Cdk5 activity genetically. A second example of the ex vivo culture technique is provided for remodeling of the connections of embryonic mushroom body (MB) gamma neurons during metamorphosis from larva to adult. The mushroom body is the center of olfactory learning and memory in the fly4, and these gamma neurons prune their axonal and dendritic branches during pupal development and then re-extend branches at a later timepoint to establish the adult innervation pattern5. Pruning of these neurons of the MB has been shown to occur via local degeneration of neurite branches6, by a mechanism that is triggered by ecdysone, a steroid hormone, acting at the ecdysone receptor B17, and that is dependent on the activity of the ubiquitin-proteasome system6. Our method of ex vivo culturing can be used to interrogate further the mechanism of developmental remodeling. We found that in the ex vivo culture setting, gamma neurons of the MB recapitulated the process of developmental pruning with a time course similar to that in vivo. It was essential, however, to wait until 1.5 hours after puparium formation before explanting the tissue in order for the cells to commit irreversibly to metamorphosis; dissection of animals at the onset of pupariation led to little or no metamorphosis in culture. Thus, with appropriate modification, the ex vivo culture approach can be applied to study dynamic as well as steady state aspects of central brain biology. Prepare complete media by filter-sterilizing Schneider's Drosophila Media supplemented with 10% Fetal Bovine Serum and 1% penicillin/streptomycin. Media should be prepared fresh each time. Alternatively, a fresh aliquot of pre-frozen media can be thawed before each use. Prior to culturing, add 10 μg/ml insulin and 2 μg/ml ecdysone to the media. Drugs were prepared as concentrated stocks and frozen in small aliquots. Thawed aliquots were not refrozen. All working solutions should be maintained at 25 °C. Add 500 μl of media to a 12 mm Millicell cell culture insert. The dissected brains will be placed in these inserts to facilitate easy immunostaining. Add a small amount of prepared media to a dissection watch glass. Holding the posterior end of the larva with a pair of forceps, carefully open up the anterior end with a second pair of #5 forceps. Quickly dissect out the brain, keeping the ventral nerve cord intact. Using pre-wet pipette tips, transfer the brain carefully into the cell culture inserts, pre-filled with media. Transfer brains, in media, to an incubator at 25 °C till the desired time-point is reached. This method works efficiently for up to 48 hr in culture. Replace the media at 8 hours. Beyond that, replace half of the media every 5-6 hours. This method of ex vivo culturing can be used to pharmacologically corroborate genetic interactions previously demonstrated in our lab 1. Add 100 μM roscovitine and 100 μM olomoucine to prepared media. Transfer dissected brains to this media. Culture brains at 25 °C for 24 hours. Replace the media at 8 hours. Beyond that, replace half of the media (with drugs) every 5-6 hours. Mark white pupae on bottles/vials. Only choose pupae that are completely white. Pupae with any sort of coloration should not be included. This stage is 0 hours After Puparium Formation (APF). These pupae will be ready for dissection 1.5 hours after marking. This step is crucial to ensure that developmental pruning occurs in ex vivo culture. Add 500 μl of media to a 12 mm Millicell cell culture insert. (The dissected brains will be placed in these inserts to facilitate easy immunostaining). Once the desired time-point has been reached, add a small amount of prepared media to a dissection watch glass. Using a small, wet spatula, pick up pupae previously marked for dissection and place them in the watch glass. Holding the posterior end of the pupae with a pair of forceps, carefully open the anterior end of the pupa case with a second pair of #5 forceps. Quickly dissect out the brain, keeping the ventral nerve cord intact and attached. Transfer the brain carefully into the cell culture inserts, pre-filled with media. Transfer brains, in media, to an incubator at 25 °C till the desired time-point is reached. We used this method for up to 10 hours in culture for the experiment shown, but it can be extended to longer periods of observation and treatment, if needed. For time-points longer than 8 hours APF, replace media every 5-6 hours. From this step on, the protocol remains unchanged for both larvae and pupae. Once the desired time-point is reached, remove media and add 500 μl of 4% formaldehyde in 1x PBS with 0.5% Triton X-100 (PBST) for 30 minutes, replacing with fresh formaldehyde after 15 minutes. Make sure not to allow brains to dry while replacing media with fixative. Wash off formaldehyde with four 10 minute washes of 1x PBS with 0.5% TritonX-100 (PBST). After formaldehyde has been washed off, block brains for 1 hour in a blocking solution of 1x PBS with 1% Normal Goat Serum and 1% Bovine Serum Albumin. Add primary antibodies made up in blocking solution. Incubate brains overnight at 4 °C. The next morning, wash off primary antibodies with four 10 minute washes of PBST. Add secondary antibodies made up in blocking solution. Leave at room temperature for 4 hours. Wash off secondary antibodies with four 10 minute washes of PBST. Equilibrate brains in Vectashield mounting media for 1 hour. Mount brains on glass slides using the Vectashield mounting media. Place glass chips on either side of the brains before mounting the cover slip. This prevents the brains from being squashed, while keeping sample thin enough to scan all focal planes with a confocal microscope. Brains were roughly oriented upon mounting to facilitate viewing the features of interest. When necessary, brain images were rotated with Imaris software to provide an optimal view for documentation and measurement. Seal cover slips with clear nail polish. Store slides away from light. Figure 1 shows a panel of third-instar larval brains of (A) wild-type flies and (B) flies that express a dominant-negative derivative of Cdk5 (Cdk5DN) (Connell-Crowley et al., 2000). Both express actin-GFP (green) in MB gamma neurons. As described previously (Trunova et al., 2011), there is a region in the proximal axons of wild-type gamma neurons that fails to accumulate actin-GFP, thus showing up as a "clear zone" (A, bracket), and fasciclin 2 protein (red) accumulates in the axons only up to the ventral border of this zone (white horizontal line). The dotted line in the third panel of Figure 1(A) indicates the position of the MB, highlighting the actin "clear zone" and its ventral border. In flies expressing Cdk5DN, the actin clear zone is absent (B) and Fasciclin 2 (FasII) immunoreactivity spreads dorsally through that region. (Note that variable numbers of FasII-positive axons project horizontally across the MB; these are not relevant to the phenotype). Scale bar represents 20 μm. Using our method of ex vivo culturing, we treated wild-type flies with a combination of roscovitine and olomoucine, pharmacological inhibitors of Cdk5 activity. Figure 2 shows a panel of third-instar larval brains of control (A) and drug-treated (B) wild-type flies. Similar to flies expressing a dominant negative Cdk5 construct, brains treated with Cdk5 inhibitors for 24 hours, show the characteristic loss of actin clear zone and shift in FasII boundary (square brackets). White lines show position of wild-type FasII boundary. Scale bar represents 20 μm. Figure 3 shows a representative series of Drosophila mushroom bodies from 0-10 hours APF, labeled with membrane-targeted mCD8-GFP (green). Brackets indicate the calyx, that is, the dendritic projections of the MB. Prior to metamorphosis, one can see MB axons coursing dorso-ventrally in thick bundles, as well as a 'haze' of fluorescent signal arising from the dense dendritic arbor (bracket). Panel A shows brains dissected at the time indicated. Note the pruning of dendrites in the region indicated by the brackets, such that by 6-8 hrs APF, the haze of dendritic signal is gone (though the axonal signal is unaffected). Brains in panel B were dissected at 0 hours APF, before the internal ecdysone spike (Truman and Riddiford, 2002), and cultured ex vivo as indicated. These show no developmental pruning of dendrites; rather the dendritic signal persists at 10 hrs APF. To circumvent this, pupae are marked at 0 hours APF, but dissected at 1.5 hours APF and cultured. Panel C shows a representative series of these Drosophila mushroom bodies from 0-10 hours APF. As in the non-cultured samples, dendritic signal is undetectable by 8 hr APF. Scale bar represents 20 μm. Chronic genetic manipulations of tissue structure and function, including mutations and expression of transgenes, typically produce a combination of immediate effects and late indirect consequences that can be very difficult to separate. Complementing genetic methods with pharmacology can facilitate interrogation of the time course behind a phenotype. For example, this has been a powerful approach for dissecting the contributions of different cytoskeletal components during spermatogenesis in Drosophila 10. In the current example, it has allowed us to show that there is a persistent requirement for Cdk5 to maintain the structure of the AIS in Drosophila. In other experiments we have also had success using drugs that target other cellular components, including protein kinases (imatinib), actin polymerization (cytochalasin, latrunculin and jasplakinolide) and microtubules (vinblastine and taxol). Ex vivo culture methods also allow high-resolution analysis of the dynamics of developmental processes. Previous studies have described short-term live imaging of the central brain 11, or longer-term imaging of other portions of the nervous system, such as the thoracic ganglia 12 and retina/optic lobe connections 13. Here, while we have focused on analysis of tissue by immunostaining of fixed material, the method we describe should be applicable to long-term live imaging of the central brain. For example, proper pruning of axons and dendrites during development of the Drosophila mushroom body is essential for establishing correct connections and innervation patterns in the central nervous system. Additionally, abnormalities in neuronal organization and remodeling are thought to underlie several neurodegenerative diseases, including Alzheimer's, ALS and Parkinson's. The technique described here allows us to emulate in vivo remodeling of neurites in the Drosophila mushroom body ex vivo, in culture. We can now image changes in development in response to genetic alterations, pharmacological treatments or changes in environment. Figure 1. 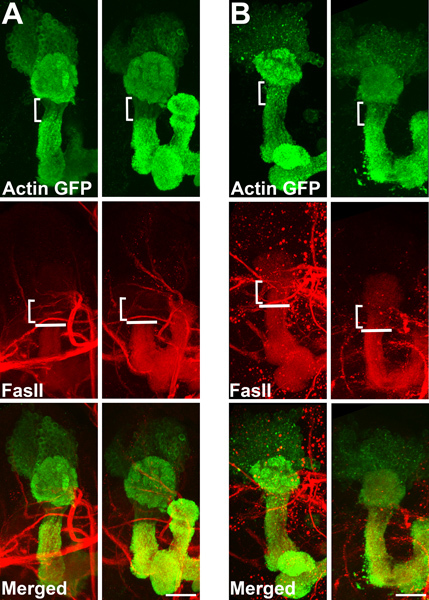 Over-expression of Cdk5DN causes loss of the actin 'clear zone' and a shift in the FasII border in gamma-neurons of the Drosophila mushroom body. Panel A shows three examples of wild-type brains stained for actin-GFP (green) and FasII (red) while Panel B shows two examples of brains over-expressing Cdk5DN. Note the loss of the actin 'clear zone' (bracket) and shift in the FasII ventral border (horizontal white line) in (B). The dotted line in (A) indicates the position of the mushroom body. Scale bar represents 20 μm. Figure 2. Treatment with pharmacological Cdk5 inhibitors roscovitine and olomoucine mimics the Cdk5DN over-expression phenotype in Drosophila mushroom bodies. Panel A shows two control wild-type brains while panel B shows two drug-treated brains, cultured for 24 hours. Note the loss of the actin 'clear zone' (bracket) and shift in FasII border (horizontal white line) in (B). Scale bar represents 20 μm. Figure 3. In vivo remodeling of dendrites of the Drosophila mushroom body dendrites can be recapitulated ex vivo. Panel A shows brains dissected at the time points indicated and stained for membrane-bound GFP (green). Note disappearance of dendritic signal (diffuse, green signal, highlighted by bracket) by 8hr APF. Panel B shows brains dissected at 0 hours APF and cultured ex vivo for the times indicated. No pruning of dendrites is seen, as indicated by the persistence of dendrites (green haze, bracket) at least as late as 10 hours APF. Panel C shows brains dissected at 1.5 hours APF, following the internal ecdysone spike, and cultured ex vivo for the times indicated. These brains show dendrite pruning similar to that seen in vivo (A). Scale bar represents 20 μm. We would like to thank all the members of our lab for their advice, useful discussions and comments on the manuscript. We would also particularly like to thank Marta Koch and Bassem Hassan for the excellent suggestion that we wait until 1.5 hours APF before dissecting brains for culturing in remodeling experiments. We also thank the NHGRI imaging facility for the use of their confocal microscope. This work was supported by the Basic Neuroscience Program of the NINDS Intramural Research Program, NIH (Z01 NS003106). Trunova, S., Baek, B., Giniger, E. Cdk5 regulates the size of an axon initial segment-like compartment in mushroom body neurons of the Drosophila central brain. J. Neurosci. 31, (29), 10451-10462 (2011). Nakada, C., et al. Accumulation of anchored proteins forms membrane diffusion barriers during neuronal polarization. Nat. Cell Biol. 5, (7), 626-632 (2003). Schmid, G., Strosznajder, J. B., Wesierska-Gadek, J. Interplay between the p53 tumor suppressor protein family and Cdk5: novel therapeutic approaches for the treatment of neurodegenerative disease using selective Cdk inhibitors. Mol Neurobiol. 34, (1), 27-50 (2006). Kahsai, L., Zars, T. Learning and memory in Drosophila: behavior, genetics, and neural system. Int. Rev. Neurobiol. 99, 139-167 (2011). Watts, R. J., Hoopfer, E. D., Luo, L. Axon pruning during Drosophila metamorphosis: evidence for local degeneration and requirement of the ubiquitin-proteasome system. Neuron. 38, (6), 871-885 (2003). Lee, T., Marticke, S., Sung, C., Robinow, S., Luo, L. Cell-autonomous requirement of the USP/EcR-B ecdysone receptor for mushroom body neuronal remodeling in Drosophila. Neuron. 28, (3), 807-818 (2000). Connell-Crowley, L., Le Gall, M., Vo, D. J., Giniger, E. The cyclin-dependent kinase Cdk5 controls multiple aspects of axon patterning in vivo. Curr. Biol. 10, (10), 599-602 (2000). Truman, J. W., Riddiford, L. M. Endocrine insights into the evolution of metamorphosis in insects. Annu. Rev. Entomol. 47, 467-500 (2002). 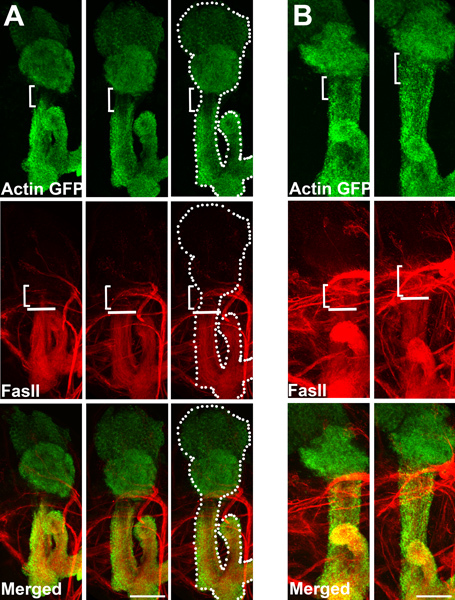 Noguchi, T., Miller, K. G. A role for actin dynamics in individualization during spermatogenesis in Drosophila melanogaster. Development. 130, 1805-1816 (2003). Siller, K. H., Serr, M., Steward, R., Hays, T. S., Doe, C. Q. Live imaging of Drosophila brain neuroblasts reveals a role for Lis1/dynactin in spindle assembly and mitotic checkpoint control. Mol. Biol. Cell. 16, (11), 5127-5140 (2005). Brown, H. L. D., Cherbas, L., Cherbas, P., Truman, J. W. Use of time-lapse imaging and dominant negative receptors to dissect the steroid receptor control of neuronal remodeling in Drosophila. Development. 133, 275-288 (2006). Williamson, W. R., Hiesinger, P. R. Preparation of Developing and Adult Drosophila Brains and Retinae for Live Imaging. J. Vis. Exp. (37), e1936 (2010).